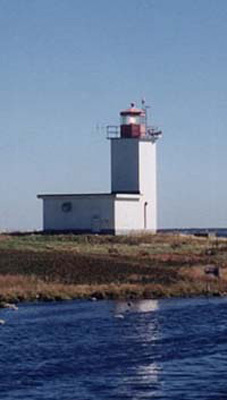 The Bon Portage Island lighthouse was established in 1874. For 110 years, 16 principal lightkeepers and their families kept the light burning on this small, windswept island. Sources: Research, We Keep A Light by Evelyn Richardson, and personal knowledge. 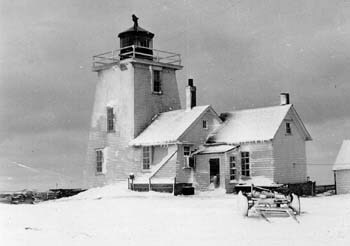 The Bon Portage Island lighthouse was established in 1874. For 110 years, 16 principal lightkeepers and their families kept the light burning on this small, windswept island. The longest serving keeper was Morrill Richardson, who along with his wife Evelyn, bought the island (except for the lighthouse property) in 1929. The Richardsons lived on the island for 35 years, raising three children in the small, drafty wooden lighthouse on the island's southern point. They supplemented Morrill's modest government salary by farming the island's rocky soil. In 1945, Evelyn Richardson's classic book We Keep A Light was published and quickly became a best-seller in Canada. 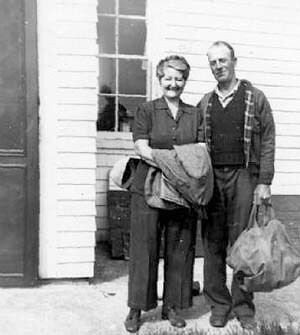 She described her family's life on the island with sensitivity and humour, noting both the disadvantages and joys of life on an isolated island. 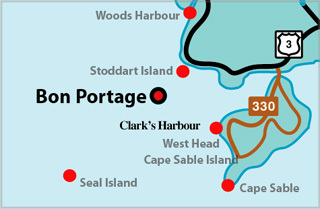 The Richardsons were greatly appreciative of the island's natural history; Evelyn's writings revealed her respect for the natural environment that shaped her family's life on Bon Portage. During the 1950s the Richardsons moved into a new house from the lighthouse "that, standing alone and unsheltered" had defied the wind and sea for eight decades. In 1964, they retired and moved to the mainland. They sold their portion of the island to Acadia University and during the same year the Department of Transport demolished the old lighthouse and replaced it with a utilitarian concrete tower. A new dwelling was built to house the assistant keeper. 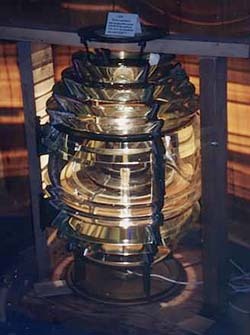 Twenty years later the lighthouse was de-staffed and the last keepers moved to other lighthouses. The chief problem with the house was that the first keeper, Will Wrayton, had seven small children. Another keeper, at least in winter, was a necessity who had to be fitted in somewhere. Will complained that they were "crawling all over each other like maggots." With or without official permission he added a kitchen ell on a stone foundation. The kitchen was complete with closet (the only closet in the house) and a door opening to the south to milder winds which were usually less violent than the northern ones. Since the new kitchen was built below the original structure, Will constructed steps to the level of the former porch. Such flights, especially in a kitchen, were known as "woman killers". Part of the former porch was then a passage to the original kitchen and the eastern part was a pantry. In winter, the pantry advanced to the status of a refrigerator. Our father, after wrestling with the results of Will's endeavours, always declared that no Irishman should ever be permitted to build anything. (He was partly of Irish descent himself.) Nothing Will built was straight, square or level. Nevertheless, I feel he had the right idea. My world, in those days consisted of these ground floor rooms, two porches on either side of the kitchen, the doorsteps of the porches, and the cleared lighthouse field. The field enclosed a barn, oil shed, Dad's truly admirable woodpile, and a long way off, stood a henhouse and outside toilet. Shortly, the field also contained a pighouse. We had a cow named Amaryllis who was mainly Jersey and who was mainly cross and unapproachable. There was a dog, Rags, who snapped at everyone and wore a muzzle. I was not afraid of Amaryllis, but so afraid of Rags I was fearful of all dogs for years. Dad didn't like cats, or thought he didn't. Mum preferred them to mice, which kept coming in uninvited. When a nearby uncle moved to Bedford, our little cousin Kenny was heart-broken when told he must leave his cat behind. When asked to give it to a younger cousin, Kenny cried harder and said that "Jackie would pull poor Teddy's tail". (He was right too; Jackie's dog led a miserable life). Kenny agreed however to give Teddy to me. Dad came home with a cat and a very sour face, but Mum was pleased and I overjoyed. Teddy really was a very nice cat, though not a mouser. His mere presence kept mice out, and the game of "The Paw" entranced Laurie and me. Teddy lay under the black, cast iron kitchen stove, out of the way of men's feet, while Laurie and I lay on our tummies on the braided mat, peering in at our now inaccessible cat. Teddy would extend a paw, and we would try to touch it before he could withdraw it. Sometimes we took turns; sometimes we both tried at once. Teddy usually tired of this before we did. I discovered that if I offered a paw, Teddy would bat at it- lightly, with never a claw. I became adept enough to sometimes beat Teddy at both forms of play, but the score was always something like Teddy 93; Anne 7; Laurie 0. Close to the advent of Teddy, Laurie and I approached Broad the ox, not having been warned against him. For a Jersey he was extremely large, with an enormous spread of horns. Because of this, the adults must have considered a caution unnecessary. At first, we merely played around him as he lay chewing his cud. Then we scratched his nose. He didn't mind, so we scratched his ears. Somehow we were climbing up one side- I had to help chubby, clumsy Laurie - and sliding down the other. Eventually we climbed over his horns and slid down his nose. We soon realized there were things we could do for our wonderful, huge playmate, which we thought of as the delightful games of Swat the Flies, Tidbits for Broad, and Tickle the Ox's Nose. Broad was seldom in the lighthouse field (we were not allowed out of it) except for those noons during which he was required for an afternoon shift. Mother most unreasonably insisted on a full hour for dinnertime. Dad would have leaped to his feet and gone to work at the last swallow. It would have done no good to tell him he must take a break, but Mother argued that it wasn't fair to the hired man. Dad fidgeted and grumbled, but finally adjusted to a few minutes' relaxation after his meal. That was when we revelled with Broad, for apparently no adult ever learned of it. A lengthy stay on the mainland resulted in the birth of Betty June, five years younger than I. That fall I began lessons, with Mother as my teacher. A decidedly squiffy Laurie was sent to play by himself. He was not good at it. Teddy disappeared, Pinknose arrived. Rags went, Peggy, a cross black Labrador, came. Grandpa Fox acquired a new radio and donated the old one to us; nothing was ever the same again.